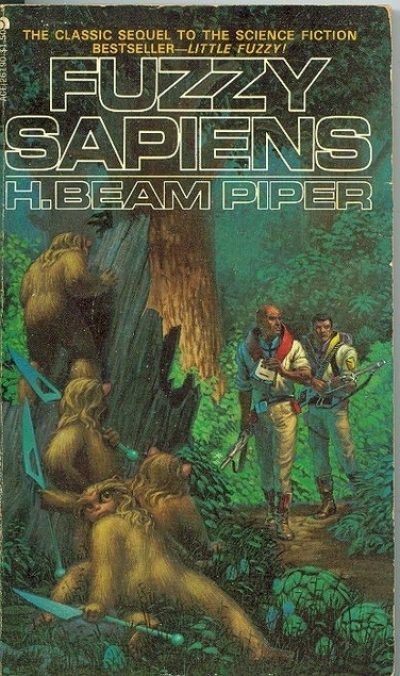 1964’s Fuzzy Sapiens, first published under the title The Other Human Race, is the sequel1 to H. Beam Piper’s Little Fuzzy. Previously: old Jack Holloway, Ben Rainsford, Ruth Otheris, and their allies triumphed over the forces of pure capitalist evil, as represented by Victor Grego and his Chartered Zarathustra Company. Zarathustra was reclassified from Class-III to Class-IV and its native Fuzzies legally accepted as people. Now Jack and his friends get to grapple with the consequences of winning. Class-III planets are run by the company that owns them. In the case of Zarathustra, that was the eponymous Company. Class-IV worlds have civilian governments and until elections can be held, the current government is made up of people drafted into administration by local navy commander Commodore Napier. Those happy few include Ben (now planetary governor), Holloway (Commissioner of Native Affairs). Every single awkward question raised by the discover of Fuzzy fuzzy holloway is their duty to answer. Victor Grego might have a bitter laugh at Ben and Holloway’s expense, but he has problems of his own. He needs to work out how to keep the suddenly charterless Zarathustra Company solvent. He needs to convince the new government that he is not the fiend they see him as, that there is more to be gained by working with the Company than against it. He needs to work out how the devil a Fuzzy found its way into his penthouse apartment. In addition to the known issues — how to prevent the Fuzzies from being exploited (people who see them as pets, ambitious criminals), how to keep gangsters from commandeering the elections, what to do for a government budget — there’s a pressing issue nobody expected. Fuzzies are flooding into the human-occupied parts of Zarathustra. Large numbers reveal something about Fuzzies that observation of small groups could not: infants are extremely rare. For reasons not understood, most Fuzzy pregnancies end in spontaneous abortion. The handful of successful births is nowhere near replacement level. Unless scientists can work out why this is and what to do about it, the Fuzzy species is doomed. By modern standards, human relations with Fuzzies are problematic. While Fuzzies are legally people, they don’t have the status of adults. Many important decisions are made for them by patronizing humans. While the protagonists fret that the Fuzzies might be abused or enslaved, they don’t have any problem with doling the Fuzzies out to families who want some, as long as the families seem responsible. Worse yet, Federation law opens worlds with natives to general colonization; one of the big issues the new government is struggling to solve is how to best manage the coming land rush. Piper seems to have been conscious of some of the potential issues. Gerd, this has happened on other Class-IV planets we’ve moved in on. We give the natives a reservation; we tell them it’ll be theirs forever, Terran’s word of honor. Some of his characters are determined to avoid that outcome. Whether or not they succeed is unclear, but … to the best of my knowledge, none of stories set later in Piper’s future history unequivocally establish Fuzzy survival. Space Viking, for example, specifically mentions Zarathustra’s sunstones and damnthings, but not Fuzzies. It would be in character for Piper to have his characters win a momentary victory and still have their efforts wiped from history. Then everybody had lost their heads. He’d lost his own a few times, and done some things he now wished he hadn’t done. Even at his most politically troglodytic, Piper was always engaging, often surprising, particularly in the context of having emerged from the Campbell-era Astounding stable. As in most other Piper books, there are women with agency3. This isn’t as charming as the book to which it is a sequel, but it’s still worth a look. Fuzzy Sapiens is available on its own here (Amazon) and here (Chapters-Indigo) and as part of a three-book omnibus here (Amazon) and here (Chapters-Indigo). 1: Although Piper died the year The Other Human Race was published, that has not prevented a steady trickle of sequels. In addition to Piper’s own Fuzzies and Other People (1983), there are 1981’s Fuzzy Bones by William Tuning, 1982’s Golden Dream: A Fuzzy Odyssey by Ardath Mayhar, 1983’s The Adventures of Little Fuzzy by H. Beam Piper and Benson Parker, 2011’s Fuzzy Ergo Sum by Wolfgang Diehr, 2016’s Caveat Fuzzy (2012) by Wolfgang Diehr, and 2016’s The Fuzzy Conundrum by John F. Carr and Wolfgang Diehr. I take a dim view of both necrolaboration and series continuations by authors other than the original, so I won’t be reviewing any of those except the one by Piper himself. 2: Aside from the minor problem that “we didn’t know they were intelligent beings when we wiped them out” is explicitly not a defence against charges of genocide under Federation law. If his plan had worked, the Feds could have sentenced Grego to a bullet in the back of the head. 3: In the case of scientist Charlotte Tresca, her excessive agency is made worse in the eyes of her superior Hoenveld by her inexcusable correctness. Not only does she pursue a line of research he considered worthless, she arrives at a useful, verifiable result and caps her crimes off by doing so where Hoeveld’s superiors can see her being flagrantly correct without permission. What makes the episode striking to me this time round are apparent parallels between Hoenveld and Tresca and John W. Campbell’s fury at Frances Oldham Kelsey’s handling of the thalidomide issue. One of my favorite books. I wonder if your young people might enjoy it and its prequel. Also, in your list of books you neglected John Scalzi's retelling. And Return of the Jedi. Scalzi's retelling had 1/100th the charm, and 100 times the cynicism of the original. An all-around disappointing book. That's a list of sequels. Scalzi's book is not a sequel. I recall one of Piper's other stories (the title may have been "Ministry of Disturbance"), in which there's a mention of the various recognized intelligent species "plus the Zarathustran Fuzzies, who could almost qualify under the talk-and-build-a-fire rule" (quoting from memory). So it would seem that the Fuzzies were not exterminated, but don't really participate in Galactic civilization. And how does this square with the Fuzzy books, where we do see them qualifying under that rule? I remember at Hostigos, an sf convention in State College almost thirty years ago, someone had a theory about this, and planned to write some Fuzzy books of his own developing it. His idea was that Fuzzies were too honest and rational, making them dangerous, so knowledge of their intelligence was suppressed. But your guess is as good as mine. "By modern standards, human relations with Fuzzies are problematic." I really had trouble getting past that (in the first book, less likely to pick up the second). It was so pervasive, it was hard to ignore. What accommodations have readers come to? IIRC, the question of why there are so few Fuzzy babies was brought up as something that needed investigating at the end of the first book.